Kawasaki shocked the world with the introduction of its 2019 KX450. Sure, the machine has lots of new components, but the Dirt Bike magazine staff thinks the 2018 model can still give it a run for its moola. We decided to make some changes to our 2018 test mule to see just what was possible. The ultimate project goal was to see if we could make it better than the 2019. 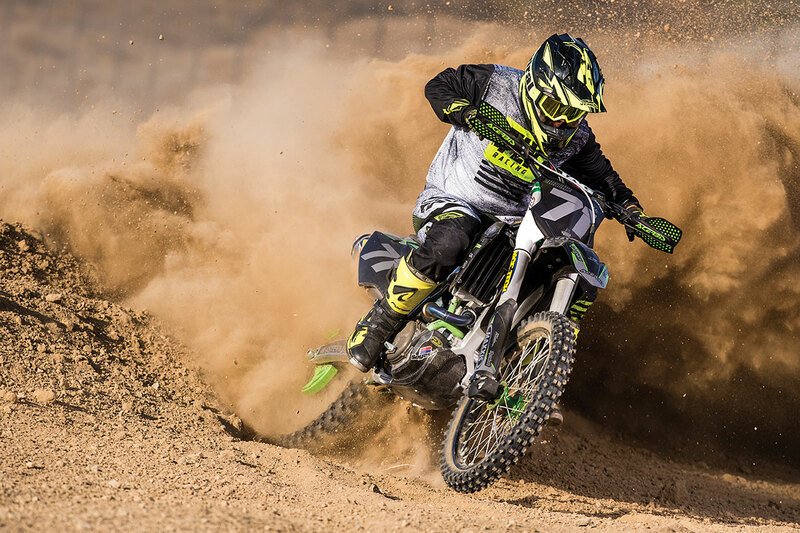 The “Next Level KX450” has no problem moving dirt. Let us address the big white elephant in the room—no, there is no way to cram an electric-starter system onto our 2018 KX450. Trust us, we tried! We did make some changes inside the engine for both power and durability. To increase power, we installed a set of Stage 2 Hot Cams. These are designed with more overall lift on both the intake and exhaust cams, allowing more fuel to flow in and more exhaust gases to flow out. We also installed a slightly higher compression piston—nothing crazy that would require us to run straight race gas, but something for a little more pop. 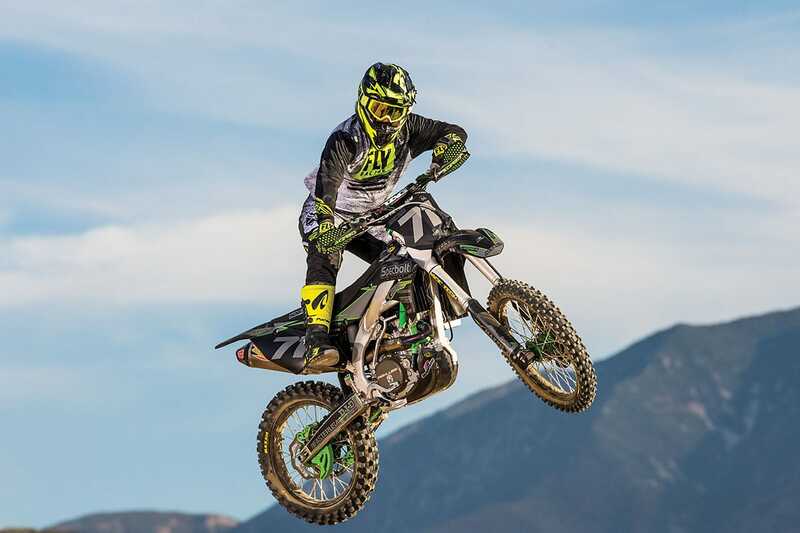 Our Next Level KX450 is a definite improvement over the stock 2018 unit. The only other performance modification installed internally was a Rekluse TorqDrive clutch pack. This system is used inside the complete stock clutch footprint. The pack is designed to use more discs internally, decreasing slip and allowing more power to be transferred to the ground. The last internal modification we made was all about improving cooling. Boyesen Supercoolers have larger impellers and covers that flow more coolant, keeping the engine operating at a cooler, more consistent temperature. CV4 silicone radiator hoses add some cool color to the build, but they also help keep the engine running cool. The Pro Circuit Ti-6 exhaust, Rekluse TorqDrive clutch pack, Stage 2 Hot Cams and higher-compression piston improve performance but with a smooth delivery. Handling was a major part of “Project Next Level.” The 2018 KX450 comes stock with a Showa TAC (Triple Air) fork setup. These are great on single big hits but don’t provide much cushioning when it comes to small chop. Checking air pressure all the time can be annoying, and, frankly, most people are confused about how to really utilize all the adjustment features. Ride Engineering’s 21.5mm clamps allowed us to run larger-diameter Tag handlebars, providing quicker turning and giving the bike a cool look. We turned to Sydney and the crew at Race Tech to help us with our handling issues. A Race Tech Spring Conversion System (SCS) was installed, transforming our air fork into a Single Function Fork (SFF). 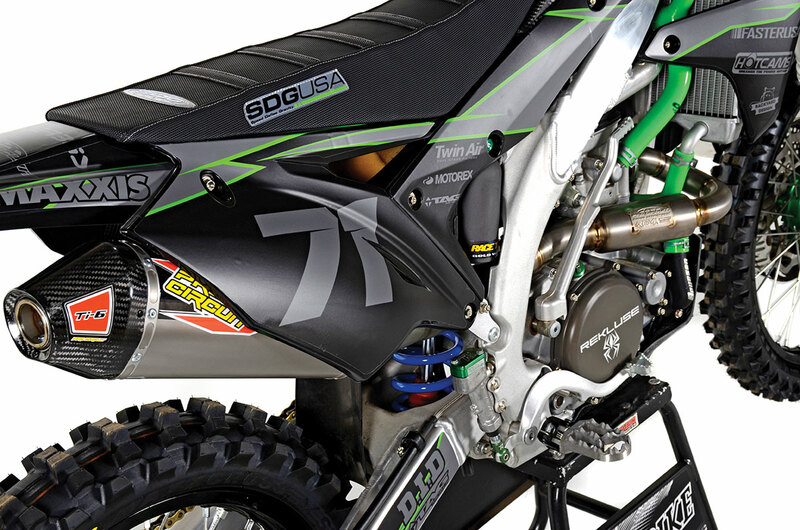 This coil-spring-style fork comes stock on current KX250F models. 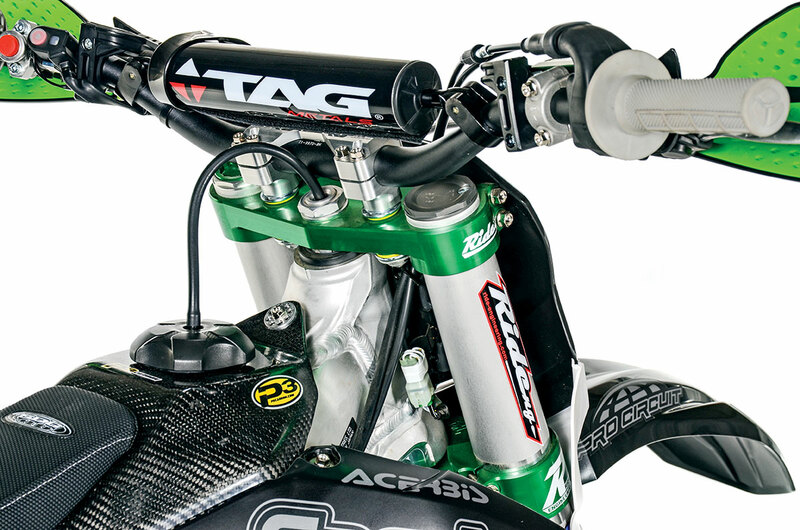 The Race Tech conversion kit is designed to work on Showa, KYB and WP air fork systems currently on the market. Sydney and the crew didn’t stop there; they installed Race Tech gold valves and re-sprung both ends of our KX450 for our specific motocross application. We also added some Ride Engineering products. Some were to improve handling while others to improve stopping power. We also installed a performance link in the rear. The link is designed to let the rear end squat so the wheel follows terrain better. A 21.5mm anodized-green triple-clamp set gave our machine a cool look and allowed us to run a larger-diameter handlebar designed to deliver quicker turning with more front-end traction. To improve braking power, we installed steel-braided lines at both ends with a rear master cylinder extension and a new V2 billet front brake caliper. 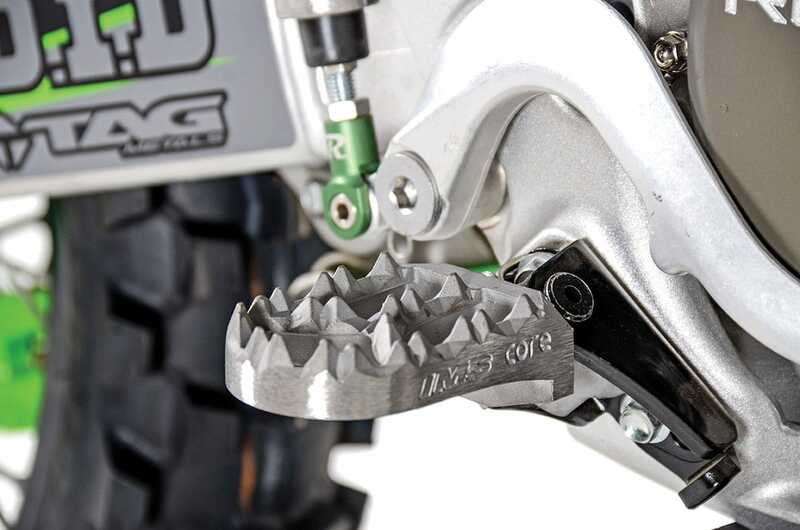 Ride Engineering’s front caliper has a larger piston than what comes stock on the 2018 KX450, with a solid CNC-machined billet-aluminum body for reducing flex and built-in cooling fins. 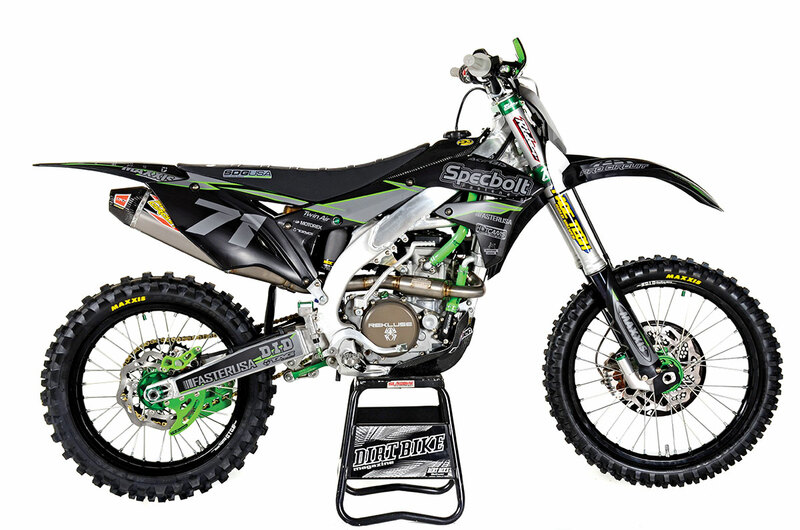 Our KX450 is adorned with Specbolt’s Nickel Wurks hardware throughout. The matte finish of the Backyard Designs custom graphics match perfectly with the custom SDG seat cover. There comes a time when it’s all about the cool factor. We decided to go a little overboard on this build, trying to achieve something completely opposite of the stock machine. We chose an Acerbis all-black plastic kit with a Raptor-style front number plate. Jared and the crew at Backyard Design came up with a completely custom graphics kit to match the theme. Carbon fiber bling was added from P3 Carbon, and the skid plate offers loads of protection. IMS Core MX pegs have an aggressive tooth design and are wider than the stock units. The chassis and engine hardware also got some upgrades with a Specbolt Nickel Wurks kit. The build was topped off with a set of wheels from Faster USA, featuring CNC-machined billet-aluminum hubs anodized green and black D.I.D DirtStar rims with stainless steel spokes wrapped in the all-new Maxxis ST tires. 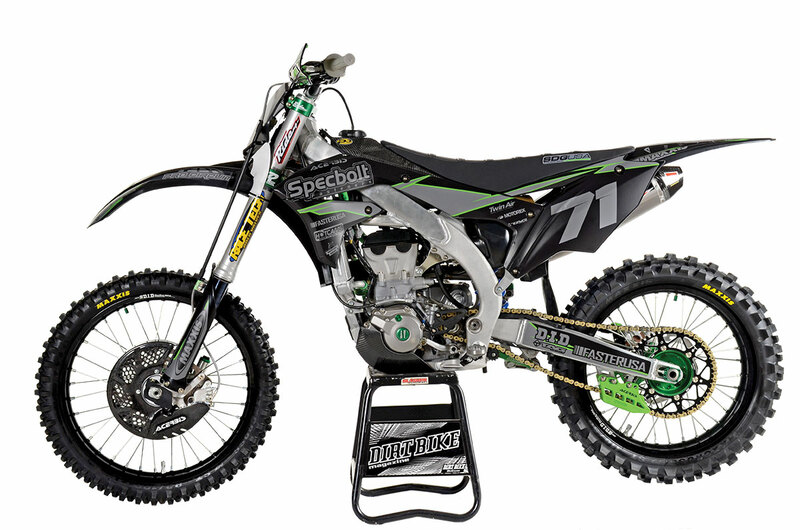 Our KX450 project definitely stepped up to a higher level than when it came off the showroom floor earlier this year. Is it better than the 2019 model? That’s hard to say, because it’s missing one key feature: the electric start. Still, overall engine performance is noticeably improved with our additions from Hot Cams, Pro Circuit, Rekluse and Vertex. The Race Tech spring conversion improves the fork action on small, consecutive chop without sacrificing resistance to bottoming on big hits. Ride Engineering’s performance link and Race Tech’s setting in the shock calm down the rear end, giving the bike a more planted feel overall. Braking power was increased, but what surprised us was how smooth and gradual the lever pull was. When it comes to the look of Project Next Level, some will love it and others will hate it. Even our staff is conflicted about it, but one thing is certain—everyone will remember it! 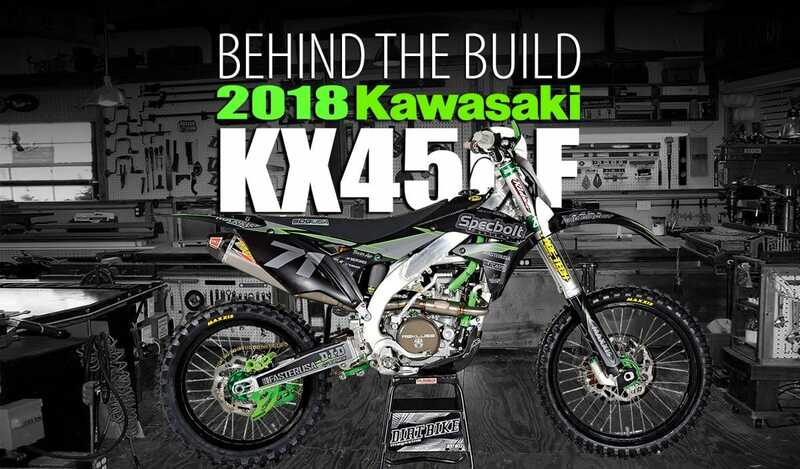 Click the above image for a Dirt Bike video on the 2018 Kawasaki KX450F project.